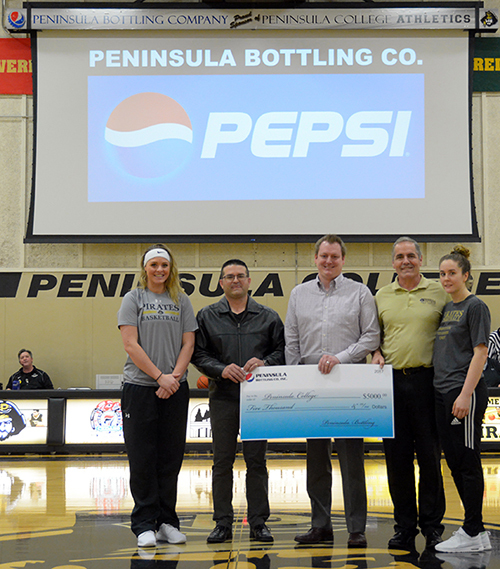 PORT ANGELES, Washington (February 11, 2017) - Peninsula Bottling Co.representatives Jim Gossard and Harrison Hinds presented Peninsula College a check for $5,000 as part of a $7,000 sponsorship package that enabled the College to purchase a new screen for its gym, as well as banners for the field, and support of Pirate Casino Night, a scholarship fund-raiser for the athletic program. Accepting the donation for Peninsula College was Rick Ross, Associate Dean for Athletics and Student Life, as well as Pirate basketball players Cami Butler and Alicia Dugan. The event took place during halftime of Pepsi Throwback Night. "Peninsula Bottling Co. has been a supporter of Pirate athletics since we started varsity athletics back up in 1997, and they continue to contribute at a very high level," Ross said. "Pepsi has helped us with scoreboards for our gym and field over the years and this contribution enabled us to use technology to recognize all of our sponsors, to show replays, and to promote events at the college on our new big screen. We are very thankful to Jim and Harrison and the Pepsi family for their support."